The Order... I'll Haaaaaaaaaaaaaave... the first half! Excellently filmed thriller just a skosh too top-heavy for perfection. It's a shame I know all too well to have just a few too many great story ideas to result in a fully coherent story. When a film looks like it's going to become an all time favorite, only to collapse under its own weight a little over halfway through it gets to be a disappointing experience. The Order is a movie with great writing, wonderfully appropriate cinematography and really good acting. It also has so many great ideas it could be two movies... and probably should have been two movies. It's not that everything doesn't work, it's that there are too many differing ideas to make for a film in the same vein as its divine subject. 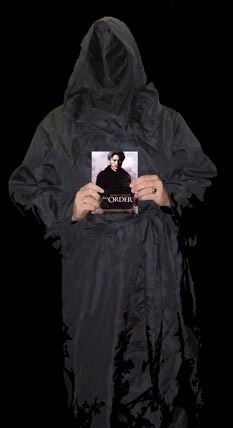 That said, The Order is precisely the sort of film that a horror and suspense fan who happens to be a Catholic is just begging for. Hey, I'll watch A Nightmare on Elm Street with you any day, but if it's a choice between that or The Exorcist or The Prophecy believe me this here Papist is pulling out the Rosary and checking out some Catholicism inspired shivers! Clearly old Brian Helgeland who wrote, produced and directed The Order has the same feeling. Here Helgeland evokes the very best of the genre that gave us Stigmata, Lost Souls and The Omen. Unfortunately, with examples I won't reveal due to spoilers, at least one of the sad clichés of the Genre pop up as well. As with A Knight's Tale, Helgeland's last outing as both writer and director, Heath Ledger joins us as the lead. Unlike A Knight's Tale this is not an unstuck and unfocused tale with pure Hollywood undertones. Ledger does very few, if any, mugs for the camera, and in fact this is Ledger's most palatable performance since... um... this is Ledger's most palatable performance. Ledger's character Father Alex Bernier is a conflicted priest of the Carolinian Order, an sect under the Vatican with some of its own (vaguely heretical) agendas such as the search for Knowledge. Let me tell you, said search goes a little farther than just the "fortune" in a "Bazooka Joe" comic. When Dominic the excommunicated former head of the Order is found dead with signs of an archaic ritual indicating a loophole for getting an unworthy soul into heaven, Father Alex travels to Rome to investigate and to find the truth about Dominic, the Order, himself, and even the surrounding forces pulling the strings both inside and outside of the Catholic Church. Joining him on this quest are fellow Order Father Thomas Garrett (Mark Addy proving again his acting range and almost unrecognizable as the father in the CBS Sitcom Still Standing), and the beautiful Mara Sinclair (Shannyn Sossamon also of A Knight's Tale showing how nostalgic Helgeland must be for the cast he loves). Together they form the "Catholic Pete, Linc and Julie" (you laugh, but they say it in the movie)! Amid the Demons Alex must battle and the temptations he and Thomas must face it is uncovered the markings on Dominic are consistent with the legend of the Sin Eater, a blessed/ cursed human with the ability to consume the sins of others before their deaths in order to deliver their souls to heaven free of corruption. Naturally this isn't all that comfortable for the Sin Eater, who after centuries of life has enough sin, guilt and memories of the transgressions of others that life is hell. As the tale progresses Alex must make difficult choices, the results of which will decide his fate. Should he choose Earthly love or the divine love of the church? Should he choose his chosen Order or a new quest? Should he turn to the camera and act cute as hell a la A Knight's Tale? The choices are interesting to watch as The Order does portray priests in a unique way... as human beings. Too often Priests are either infallibles or betrayers to the cloth without middle ground. Well, Insert Thorn Birds reference here because (drum roll) Priests are people too. Thomas, Alex and Driscoll (a sorely missed Peter Weller) have their Holy Orders, but also occasionally have a drink, a smoke or a swear word. No this isn't in Excess, nor are these guys shown as slithering rejects from some New Orleans Leather Bar or child molesters (happily this plot exists against the backdrop of the Catholic Church without delving into its recent scandals). Within this story lies the truth that very little is exactly as it seems including a secret and separate splinter of the Catholic Church with an eye to the Papacy! Not to mention the machinations of the Sin Eaters who have their own view of the past and plan for the future. Quite a lot to keep up with? Yeah, it sure is. And that's the main problem with this otherwise great film. It's not that the film is inaccessible or hard to follow for anyone with intelligence, it's that the film can't quite decide what it wants to be (not that its characters can either). What we have here is drama, romance(! ), horror, suspense, mystery and action all rolled into one. It's easy to understand and it's easy to like, but it's not necessarily all that it sets out to be, and ultimately the last fourth or so collapses under the weight of all the set ups. What else is it not? It's definitely not silly and campy. Ledger is pretty gosh darned good in this roll. Father Alex, even in his most emotional, never devolves into overacting and is always believable. Mark Addy is absolutely incredible in everything I've seen him in, and he's as different from his other roles here as can be. Trust me, you've seen him in a few things before, but you probably never realized it was the same guy (and, yeah, yeah, he was in A Knight's Tale too). Sossamon is lovely and sympathetic and handles what she does perfectly. The audience feels for her almost in spite of itself. Weller is also great and dissolves well into the role of Michael Cardinal Driscoll alternately composed and emotional. Likewise Benno Fürmann as William Eden is amazingly complex... sympathetic and sinister at the same time. Helgeland's directing is great and serious, and the cinematography is grainy and dour making the film look as creepy and ancient as the Old Rome it takes place in. The dialogue and character development are better than one could ask for outside of an Alan Moore comic. What is truly notable is that Helgeland really did his homework when it came to Catholicism, heresy and conflicting orders. He seems to take special care in his fictionalized, yet plausible script. Which makes the ultimate misfire that The Order experiences all the more sad. In the second half where decorum would suffice, sensationalism is chosen. When faith and duty would work, the folly prevails, and bleakness beats hope in all ten rounds. Negativity and futility have caused the downfall of many a scary movie in the last, but the beginning deserves a better conceptual completion. Each of the film's many ideas and plot paths must have its own ending to tie up each loose end, and thus the film actually has about four concurrent finales. All of them are good and exciting, but the six-pack of the final act is a microcosm of the entanglements of the entire plot. It doesn't take Divine Intervention to get more from me! Click here to pray with my reviews! The Order reviewed by J.C. Maçek III who is solely responsible for his views and his confirmation name of Zaccaria!